According to a recent EY report, financial distress among mining and metals companies is expected to shape merger and acquisition (M&A) activity in the sector in 2016, with divestments picking-up pace on the back of volatility and uncertainty on the timing of a recovery. EY’s report, A new normal, or the bottom of the cycle? 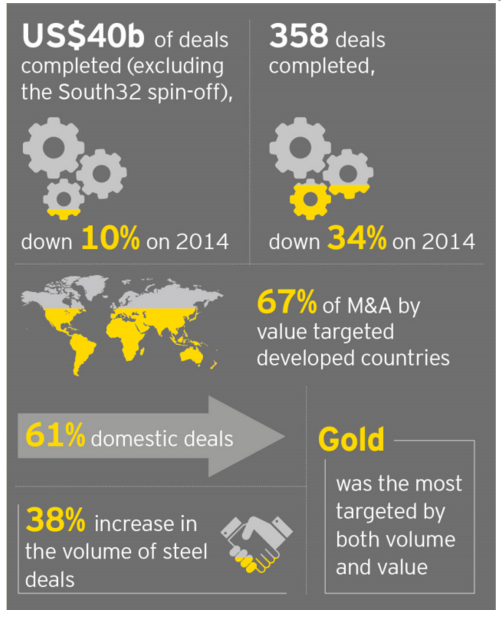 Mergers, acquisitions and capital raising in mining and metals, 2015 trends and 2016 outlook, notes that after the fifth consecutive year of declining deal volume and values, increasing levels of financial distress will trigger more divestments, spin-offs, joint ventures and possibly hostile takeover bids. The report warns that with a glut of assets, scarcity of capital, selective buyers and market conditions forcing accelerated sales, getting divestment processes right will be paramount to achieving a sale for even the best quality assets. More deals will be completed by private capital, but only the best assets will attract their focus and pricing will remain disciplined. Deferred consideration will grow in popularity due to limited buyers and extreme price uncertainty. Spin-offs as a means to package and divest assets have increasingly been featured in boardroom discussions and will remain high on the strategic agenda, but the level of working capital required will see few actually completed. Increasingly, mergers and joint ventures will be pursued, with the key focus on de-risking and preserving capital. The necessity to de-risk and preserve capital will drive deals to completion. Ongoing price volatility could see hostile takeover bids from better capitalized entities, but only where the takeover target operates desirable, low-cost assets in stable jurisdictions. A new normal, or the bottom of the cycle? Mergers, acquisitions and capital raising in mining and metals, 2015 trends and 2016 outlook, is based on analysis of 2015 deals and capital raisings completed by 31 December 2015. Data is primarily sourced from ThomsonONE and unless otherwise stated all values are in US dollars. A full copy of the report is available online here.